Ben's Tallit Shop is located in Modi'in Illit, which is about halfway between Jerusalem and Tel Aviv. Our tallit and tzitzit shipping center is not set up as a retail store open to the public, but we're always glad to receive visitors. We're normally available Sun.-Thurs. from 10:30 a.m. to 3:30 p.m., but be sure you call (08-923-7272 or 052-719-1202) or email (BensTallitShop@gmail.com) before dropping by. 1) From the Rav Shefa Shopping Mall in Jerusalem, take Line 330. 2) When you arrive in Modi'in Illit (about 45 minutes) you'll go by a giant traffic circle ("Kikar HaShevatim"). The bus will then turn left and head up the hill, going through a second traffic circle. Immediately after the third traffic circle get off at the "Kupat Cholim" stop. 3) Cross the street and walk through the parking lot to the end. 4) Open the black gate, walk down the stairs and knock on the door. 1) When you arrive in Modi'in Illit (about 5 minutes from Modi'in and the Shilat Junction) turn left at the giant traffic circle ("Kikar HaShevatim") and drive up the hill. 2) At the next traffic circle turn left and continue driving up. 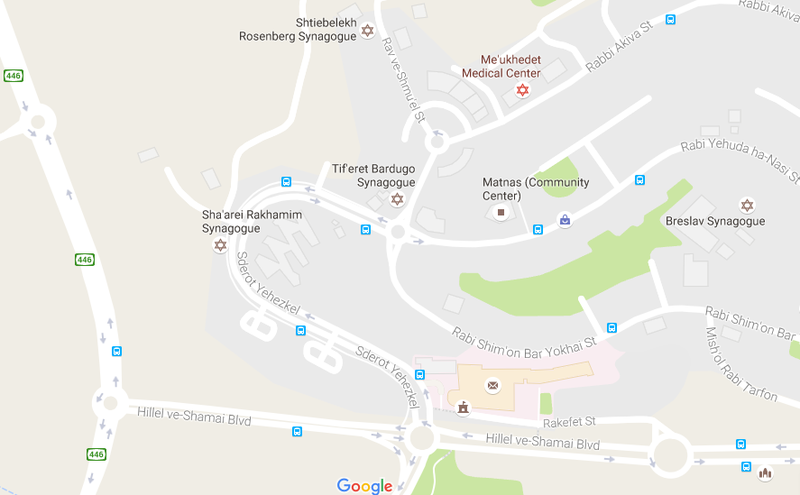 3) At the third traffic circle turn right onto Rechov R' Akiva. 4) Immediately turn left into the narrow parking lot and park at the end. 5) Open the black gate, walk down the stairs and knock on the door.